Coupon/Offer Details: IPL Special Deal: McDonald India is offering an exclusive deal where all online users can get a free burger on ordering for above Rs 349. Use the given promo code at checkout page. Offer is for a limited period in all operational cities. Grab it today !! Coupon/Offer Details: Verified on 23 Apr 2019. McDonalds is Offering McChicken/McVeggie Burger with Regular Coke FREE on purchase above Rs 275 across all best-selling categories. Apply the given coupon code at checkout page. Valid on all bank cards/COD/net-banking transactions except McGold. Valid for new customers on web, app and m-site of mcdelivery. Also, order delicious chicken kebab burger double patty with onions and cheese customized with every order for best price online. Get the all new and healthy whole wheat bun burgers starting at Rs 41 only. Coupon/Offer Details: Verified on 23 Apr 2019. GrabOn-McD Exclusive Discount!! McDonalds offers the mind-blowing and terrific deal, where new customers can get a Free Medium Burger Meal on all orders above Rs 425, (excluding premium burger meals). In order to get this user have to use the given promo code during checkout. Valid only once per user. 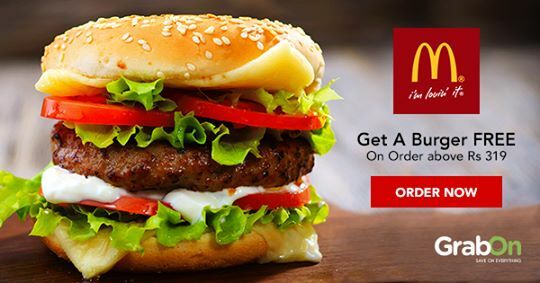 Coupon/Offer Details: Grab 2 Mcd Veg/Chicken burgers free on all the orders above Rs 625 from landing page. Valid for new users on all payment methods. Coupon is applicable only once per customer on regular and advance orders. Coupon/Offer Details: Festive Bonanza Offer: Introducing McGold, McDonalds Loyalty programme for West & South regions of India. You can now earn 100 McGold points while you order from our McDelivery website and app of minimum Rs 299 worth from menu online and use the points to pay for your next meal. Order now and earn with your meal! Currently open to selective customers only. Redeem your McGold for more yummy food! Also, order above Rs 649 on mcdelivery app/web store and get 30% mcgold which is redeemable 3 times per user. Offer will be auto-applied at checkout. Grab 80 McGold points on ordering minimum cart value of Rs 539. Valid once per user. Coupon/Offer Details: Get any 2 Mcdonalds Veg/Chicken medium burger meals free on all the orders above Rs 749 from landing page. Valid for new users on all days. Offer is applicable only once per customer on regular and advance orders. Grab this great deal by referring friends/family to mcdelivery web/app and get a mcchicken/mcveggie burger along with coke absolutely free on the order online. Offer coupons are not required to avail this limited period promotion. Valid once per User. Valid only for Western and Southern Regions of India, Until stocks lasts. Coupon/Offer Details: Order your favorite variety of Maharaja Mac Meal and Maharaja Mac Meal Junior; starting at Rs 150, and Huge on taste and large in size, the Maharaja Mac is a culinary delight of two delicious patties enveloped by smooth exotic sauces, fine cheese slices, fiery jalapenos and crunchy onions placed on bed of fresh lettuce. Its rich taste and large size takes so much time to finish. Go ahead, try this wonder burger now! Mcdonald is giving you a chance to reserve your Snoopy Happy Meal toy! To add to the happiness you get a Phirni McFlurry (regular) FREE..
Applicable on both website and app using the given voucher code. Buy 2 pack of medium fries with your order from mcd menu and get the third one absolutely free. Valid only for paytm new users. Coupon/Offer Details: Verified on 23 Apr 2019. McDonald’s has unveiled two combos - the Festive Combo and the Chicken Combo. Menu comprises various products, ranging from savoury vegetarian and non-vegetarian burgers, wraps, naans, sides, and desserts. New combos will start from Rs 159 only and will be available in all restaurants across the west and south region and get french fries worth Rs 90 free. They have a choice of scrumptious burger, naan or wrap, paired with fries along with a soft-serve hot fudge and a Coke. Chicken Combo in the west will consist of a spicy chicken patty, chicken strips and Chicken McNuggets with Coke for Rs 325, while the same will be available in south with chicken wings, chicken strips and Chicken McNuggets with Coke and the newly-launched Sriracha sauce. Coupon/Offer Details: Verified on 23 Apr 2019. New Launch Today: Mcdelivery has just introduced/added spicy and cheesy rice bowl combos in veg and non-veg varieties to the menu at the landing page served along with french fries, beverages, smoothies, milkshakes etc. Browse through the menu and grab them at as low starting at just Rs 173 and non-veg rice bowls starting from Rs 261 and mexican cheesy fries + medium coke for Rs 146 only, try them now at lowest price deals. Discount coupons are not required. Order Now! Coupon/Offer Details: Verified on 23 Apr 2019. Nothing Can Come Between You and McDonalds not Even Traffic. McDonald Promises 29 Minutes Delivery Or Else Get Rs 50 OFF On Your Next Order. Please follow the landing page for more details and order today and grab your yummy food today. This is a limited period sale, so hurry up and grab it today. Coupon/Offer Details: Verified on 23 Apr 2019. Order Above Rs 279 worth snack items and Get a McChicken or McVeggie with a Regular Coke absolutely FREE from Mcdonalds online store. Offer applicable only for limited period on both web and app. Coupon/Offer Details: Verified on 23 Apr 2019. Mcdonalds has just launched McSaver mega combos which has wide variety of scrumptious snack food options, Now Order Masala Wedges/Mexican Aloo Wrap/Chicken Strips and add Lemon Zest/Mango McSwirls/Coke McFloat beverage and get them delivered at lowest prices starting at Rs 65 per combo. Coupon codes are not required. Also, grab newly arrived Mcsaver breakfast combos starting at Rs 99, Choose your favourites from their breakfast menu from 7AM Till 12PM everyday. Hurry! Verified on 23 Apr 2019. McDonalds is offering additional 10% points of maximum 25 mcgold to wallet on all orders above Rs 149. Order for Rs 299 and get 20% McGold Points (Maximum of 70 points per order). This is a soon to be ending exciting offer. Coupon/Offer Details: Confirmed Today! McDonalds is offering value packs and family meals (veg) starting at Rs 522 and non-veg meal at Rs 534. This is valid in selected cities only. No promo voucher code needed. Also, Your ticket to enjoy the best of both worlds lies at a McDonald's close to you. Introducing Half price combo meals which consists of burgers/coke/soft serve/french fries starting at Rs 60 and order McEgg Burger for just Rs 47, An egg lover’s delight, which is a unique combination of perfectly steamed egg, classic mayonnaise, chopped onions with a sprinkling of magic masala sandwiched in a toasted bun.. Pre-Book Now! Coupon/Offer Details: Verified on 23 Apr 2019. Mcdonald is Offering Best Price on Sharing Packs with Spicy and Maharaja varieties. This Exciting Menu at Mcdonald is Designed to be shared among Friends and Family. Click Here for Best Deals on Sharing Pack of 2 Persons at Just Rs 213 which has 2 Small Cokes, Two Burgers, 1 Medium Mc Fries, Chilli Paneer Pockets. Add medium soft serve for just Rs 50 with these sharing packs. Also get Sharing Pack for 3 Persons, which has 3 burgers, 1 large fries, 3 veg. pizza mcpuff, 3 small coke at Just Rs 353 only. No Code is Required to avail this best deal. Please follow the landing page for more details and Order Now.This is a limited time offer so hurry up and grab this mcdonald pizza offer today. Verified on 23 Apr 2019. McDonalds is Giving away Special Offer for Drive Thru VIP Pass Holders. Applicable in Mcdonalds stores in North and East India only. Grab this combo meal offer for chicken lovers at just Rs 299. Order Now! Thanks for the feebback, Keep Visiting! Coupon/Offer Details: Verified on 23 Apr 2019. Mc Donalds is offering best deals on all new Breakfast daily combo meals and fast food menu varieties starting at just Rs 29, Available in selected Mumbai stores only. No coupon needed. Grab breakfast feast varieties for just Rs 120 having veg mcmuffin and egg/cheese mcmuffin, hash browns, hot cakes etc. on the menu. Also, order new happy hours combo deals of chatpata naan aloo + reg. coke @ Rs 76 and chatpata naan chicken & reg. coke for Rs 92 only and American Cheese Supreme - Chicken at just Rs 114. Grab Veg Pizza McPuff for lowest price of just Rs 40. Crispy brown crust with a generous helping of rich tomato sauce, mixed with carrots, bell peppers, beans, onions and mozzarella. Coupon/Offer Details: Confirmed Today. McDonald is Offering Mc Cafe at Best Price. Get Here Mc Cafe Frappe, Mc Cafe Classic Coffe, Mc Cafe Ice Coffee, Mc cafe Lemon Ice Tea, Mc Cafe Green Apple Tea, Mc Cafe Strawberry Ice Tea. etc Where Price Starts at Rs 105. No Coupon Code is Required. Please follow the landing page and order it today and enjoy your food and enjoy the yummiest lunch/dinner with your friends and family. Bring in a beautiful day or finish your McMeal with a cup of aromatic, creamy tea. Order Now! Verified on 23 Apr 2019. McDonald’s is providing best price deals where every user can avail veg supreme mc muffin meal for just Rs 115 by saving flat Rs 28 on purchase. Coupon code is not required. Verified Now. Mcdonald's is providing 2 Free McVeggie/McChicken Burgers and a Large Coke combo absolutely free on all orders above Rs 299 using FC299 promo code. The entire invoice value has to be settled using Freecharge Wallet, Offer is valid once per user per day. Promo is applicable on the McDelivery India App - In West and South regions. Also, Get flat 20% Cashback of up to Rs 40 on 1st, 3rd and 5th transactions made through Mcdelivery app and website in the form of Freecharge Gift Voucher within 72 (seventy two) hours from the date of transaction which can be redeemed on the Freecharge website or Freecharge application or any other merchant website. Offer is valid once per user per month. Cashback will be credited to Freecharge wallet within 24 hours. Order Now! Verified on 23 Apr 2019. McDonald is offering Mcd Econo Meal; a burger (masala, aloo, egg, chicken etc. ), small fries, spiderman toy and small coke put together to make your food experience even more memorable. Starting at just Rs 89. Prices are exclusive of taxes. In the McD's Happy Price Combos Offer: The burger and drink option can be changed in the Happy Meal by paying difference in the Menu prices. Coupon/Offer Details: Verified on 23 Apr 2019. Happy Meal Sale: McDonalds is offering limited period deal where you can grab a justice league toy for Rs 49 by adding any mcd small/medium/large meals. All prices are of tax inclusive. No exchange/No return for online orders. Treat your taste buds to our twist on India's very own classic and wholesome rice pudding. Indulge in the Phirni McFlurry that's flavoured with delicate spices, fragrant rice and condensed milk. Also, order New Chocolate chip muffin for just Rs 104! Verified on 23 Apr 2019. Mc Donalds newly launched brand McCafe has just announced mega combo deals on hot coffee + muffin/coke and cold coffee for just Rs 139, Rs 179 respectively. Grab 2 hot coffee varieties for just Rs 149. Hot beverages will be in small size. cold beverages served here will be in regular size. Also, checkout newly arrived fruit splash varieties like mixed fruit and raw mango which are available in small and regular sizes at Rs 83 and Rs 100 on the mccafe menu. Order today! Verified on 23 Apr 2019. McDonald is offering flat 10% cashback via amazon-pay wallet on burger, desserts, meals, sides, beverages order online which gives maximum savings of up to Rs 50 per order to amazon pay wallet on each successful transaction via website or mobile app. The joy any Indian gets when they get discounts on the discounted price is un-expressed. McDonald's may be cheap and pocket-friendly but we make sure you get more for your money's worth. Because you know, ”Kyu ki, Ye dil maangey more!” Puns aside, check out GrabOn for the best deals you will ever find before you hog on to your heart's content. Yes, do not forget to use the mcdonalds coupons! How to use McDonalds discount codes? Go to GrabOn.in type in McDonalds in the search bar and press enter. Copy the Code and visit Mc Donalds website/ Mcdelivery app. Select your choice of burgers, wraps, snacks, cool drinks, apply the discount code or Mc donalds coupons at checkout page while placing the order. This is how you can avail McDonald’s vouchers. Think Hamburger, think McDonald's! McD has pioneered to the top to become the world's largest hamburger selling restaurant in the world. They have left their mark in 118 countries and fill the tummies of an astonishing 68 million customers (approx.) every single day. McD has slowly turned from just being a restaurant to being a brand name. With 1.5 million people, McDonald's have become the second largest private employer behind Walmart. Such is the growth it has witnessed over the last two decades. Use the mcdonald’s coupons to make the most of the orders you place at their online stores. McD has introduced new and interesting concepts so that all their customers find happiness in whatever they eat. From spicy burgers to mild ones, you will love them all. Children too can't stop going to this place. McD has found the perfect way to woo toddlers to come into their restaurant! What better way than giving away free toys with every meal they buy. Brilliant idea! Isn’t it? And couple with such exciting offers are the McDonald offers. So, why not use these to save some money on your orders? No more spending money to eat roadside unhygienic food to save your money because hey! McDonald's offers amazingly cheap food at an ever more amazing price. Their “Happy price menu” is for all those people who intend to save their money and still fill their appetite. They never fail to deliver a grin to its customers along with their food. So, go on use McDonald promo code listed here on this page to avail of a great offer from the brand. Not a big fan of hamburgers, but love to hog on wraps and love having milkshakes? Your wish is their command. McDonald's offers you the best in desserts and wraps you will ever find. Every customer's wish is granted and every taste bud is satisfied here. Trying hard to find a reason not to visit this place or simply place a McDonalds online order? All the best! You'll need it. If you’re under the assumption that McDonalds serves only burgers, wraps, cold drinks and desserts, you’re mistaken. McDonalds serves a plethora of beverages under the McCafé banner. From cappuccino to latte, macchiato, espresso all the way to Maha-Smoothies made with real fruits, McCafé has it all. You can also share your drink with friends and family with the help of Share Shake offer. So, what are you waiting for. Place an order today using the McDonalds coupons 2019and save a lots. Well, we are not here to convince you to place food orders at this store, but we will tell you how you can grab free McVeggie or McChicken. Avail such great range offers plus some extra food using McD coupons and online promo offers. Read on to know more about their offers. Now, get rid of your Monday blues with a happy meal, maharaja mac or a generous offering of Choco Chip McFlurry. Expecting a long Tuesday at work? Here’s something to start the day on a positive note – crispy hash browns, buttered hot pancakes, McEgg burgers and a whole different range of McMuffins the likes of egg and cheese, sausage and egg and sausage McMuffin. Don’t have to worry about splurging with mcdonalds breakfast coupon and offer. Wednesdays are here and midweek crisis catching up to you? Shrug it off with the delectable menu and wash it off with coke mcfloat or a nice cup of black tea. Get the best deals with mcdonalds coupon codes. Be it a Thursday, Friday or the weekends i.e. Saturday or Sunday, enjoy a nice meal at McDonalds. How To Use McDonalds Coupons On GrabOn? You can now munch away on your favorite snack as much as you want using mcdonalds coupon codes. McDonalds India known for the quality fast food and incredibly fast service, brings you a plethora of options from wraps to burgers, cold drinks, hot beverages, nuggets, chicken wings, swirls, ice cream flurries and much more. You can order for 3 or more people using sharing packs or order yourself a meal by adding fries and cold drinks with your choice of burger or wrap. You can take your kids and little ones for grabbing some snacks and cute toys that come with the happy meals. Whether you’re rushing for an early lunch or planning to throw a little office get together with a few of your colleagues, McDonalds India has you covered. Along with the wide variety of choices offered, another thing that makes McDonalds stand out is the service. The staff is ever so friendly and they make sure all of your orders are taken and processed quickly (whether in person or over the phone). McDonalds makes sure that you, the customer, faces no issues when it comes to any questions, queries regarding the food order placed. Good food, great service and even better services are some of the reasons there are over 310 restaurants currently operational after opening in India in the year 1996.